Azure Kubernetes Service (AKS) can be configured to use Azure Active Directory (AD) for user authentication. 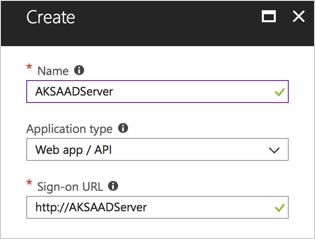 In this configuration, you can sign in to an AKS cluster using your Azure Active Directory authentication token. Additionally, cluster administrators are able to configure Kubernetes role-based access control (RBAC) based on a user's identity or directory group membership. 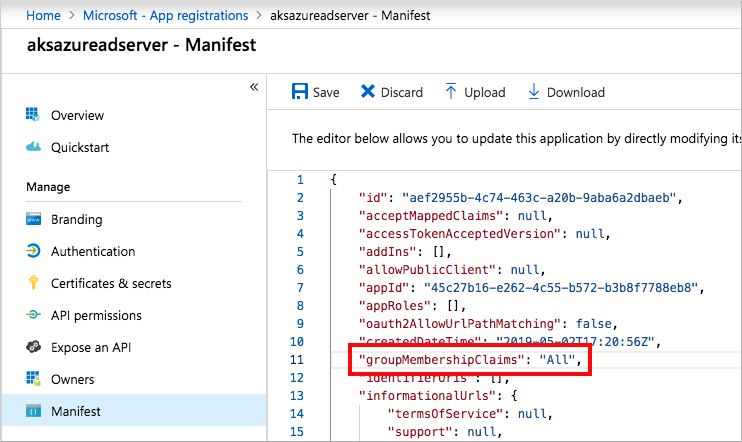 This article shows you how to deploy the prerequisites for AKS and Azure AD, then how to deploy an Azure AD-enabled cluster and create a basic RBAC role in the AKS cluster. Azure AD can only be enabled when you create a new, RBAC-enabled cluster. You can't enable Azure AD on an existing AKS cluster. Guest users in Azure AD, such as if you are using a federated login from a different directory, are not supported. Azure AD authentication is provided to AKS clusters with OpenID Connect. OpenID Connect is an identity layer built on top of the OAuth 2.0 protocol. For more information on OpenID Connect, see the Open ID connect documentation. From inside of the Kubernetes cluster, Webhook Token Authentication is used to verify authentication tokens. Webhook token authentication is configured and managed as part of the AKS cluster. For more information on Webhook token authentication, see the webhook authentication documentation. When configuring Azure AD for AKS authentication, two Azure AD application are configured. This operation must be completed by an Azure tenant administrator. The first Azure AD application is used to get a users Azure AD group membership. Select Azure Active Directory > App registrations > New application registration. Give the application a name, select Web app / API for the application type, and enter any URI formatted value for Sign-on URL. Select Create when done. Select Manifest and edit the groupMembershipClaims value to "All". Save the updates once complete. Back on the Azure AD application, select Settings > Keys. Add a key description, select an expiration deadline, and select Save. Take note of the key value. When deploying an Azure AD enabled AKS cluster, this value is referred to as the Server application secret. Return to the Azure AD application, select Settings > Required permissions > Add > Select an API > Microsoft Graph > Select. Under APPLICATION PERMISSIONS place a check next to Read directory data. Under DELEGATED PERMISSIONS, place a check next to Sign in and read user profile and Read directory data. Save the updates once done. Choose Microsoft Graph from the list of APIs, then select Grant Permissions. This step will fail if the current account is not a tenant admin. Return to the application and take note of the Application ID. When deploying an Azure AD-enabled AKS cluster, this value is referred to as the Server application ID. Give the application a name, select Native for the application type, and enter any URI formatted value for Redirect URI. Select Create when done. 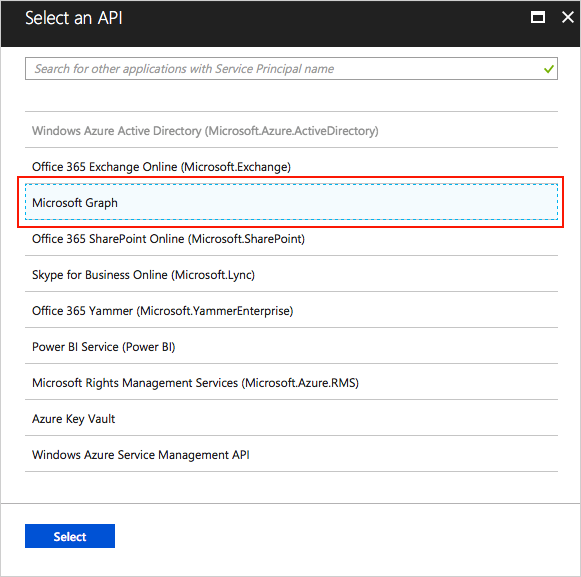 From the Azure AD application, select Settings > Required permissions > Add > Select an API and search for the name of the server application created in the last step of this document. Place a check mark next to the application and click Select. Back on the AD application, take note of the Application ID. 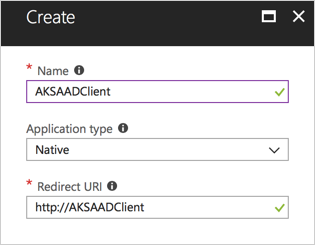 When deploying an Azure AD-enabled AKS cluster, this value is referred to as the Client application ID. Finally, get the ID of your Azure tenant. This value is also used when deploying the AKS cluster. 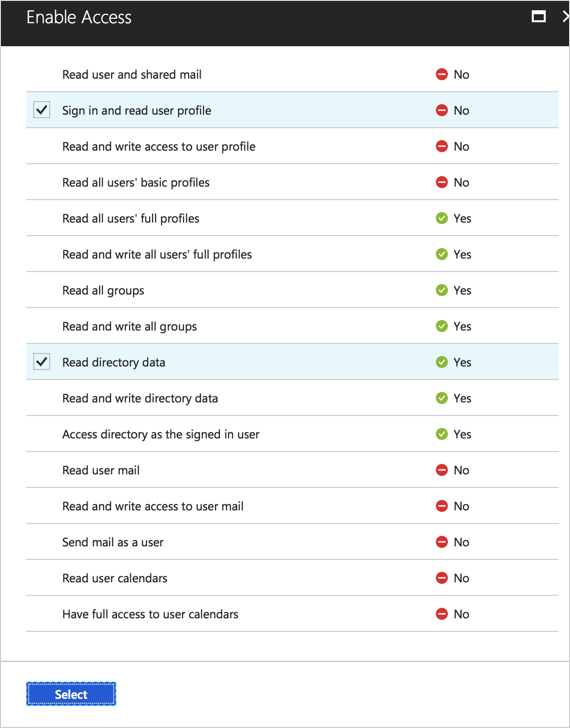 From the Azure portal, select Azure Active Directory > Properties and take note of the Directory ID. When deploying an Azure AD-enabled AKS cluster, this value is referred to as the Tenant ID. Use the az group create command to create a resource group for the AKS cluster. Deploy the cluster using the az aks create command. Replace the values in the sample command below with the values collected when creating the Azure AD applications. Before an Azure Active Directory account can be used with the AKS cluster, a role binding or cluster role binding needs to be created. Roles define the permissions to grant, and bindings apply them to desired users. These assignments can be applied to a given namespace, or across the entire cluster. For more information, see Using RBAC authorization. First, use the az aks get-credentials command with the --admin argument to sign in to the cluster with admin access. Next, create a ClusterRoleBinding for an Azure AD account that you want to grant access to the AKS cluster. The following example gives the account full access to all namespaces in the cluster. 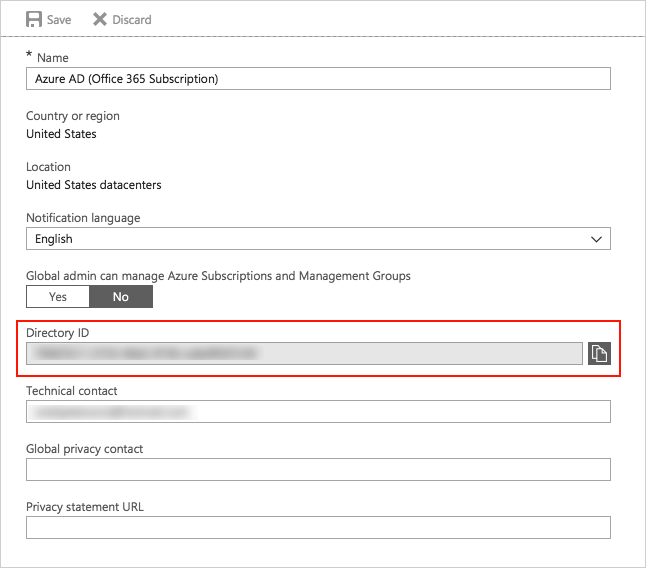 If the user you grant the RBAC binding for is in the same Azure AD tenant, assign permissions based on the user principal name (UPN). Move on to the step to create the YAML manifest for the ClusterRuleBinding. Create a file, such as rbac-aad-user.yaml, and paste the following contents. On the last line, replace userPrincipalName_or_objectId with the UPN or object ID depending on if the user is the same Azure AD tenant or not. For more information on securing a Kubernetes cluster with RBAC, see Using RBAC Authorization. Next, pull the context for the non-admin user using the az aks get-credentials command. After running any kubectl command, you will be prompted to authenticate with Azure. Follow the on-screen instructions. To sign in, use a web browser to open the page https://microsoft.com/devicelogin and enter the code BUJHWDGNL to authenticate. Once complete, the authentication token is cached. You are only reprompted to sign in when the token has expired or the Kubernetes config file re-created. The user you are signing in as is not a Guest in the Azure AD instance (this is often the case if you are using a federated login from a different directory). The user is not a member of more than 200 groups. To use Azure AD users and groups to control access to cluster resources, see Control access to cluster resources using role-based access control and Azure AD identities in AKS. For more information about how to secure Kubernetes clusters, see Access and identity options for AKS). For best practices on identity and resource control, see Best practices for authentication and authorization in AKS.